In late March, Ms. Sailitafa Samoa, Program Director of the American Samoa Area Health Education Center (ASAHEC), based at the American Samoa Community College (ASCC), conducted an outreach visit to Manu’a as part of the ASAHEC mission of increasing the number of future local health workers. For part of the trip, Ms. Samoa was assisted by two students representing the ASCC chapter of the Health Occupations Students of America (HOSA), chapter President Miss Tamara Bailey and Treasurer Miss Rosalia Taotofi. The ASAHEC/HOSA team spoke to students at Manu’a High School, Faleasao Elementary School and Matasaua Elementary. 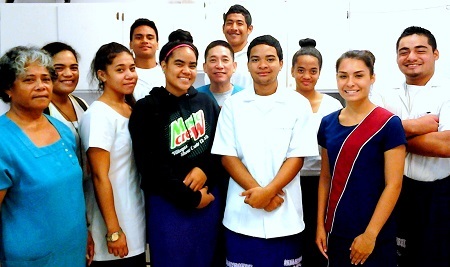 For the final activity of the visit, preselected Manu’a High School students took an ASAHEC-directed field trip to the Ta’u Health Center. Ms. Samoa began the outreach “solo” at Manu’a High School, where she spoke to a total number of 48 students from all four grade levels in individual sessions. The topics covered included an introduction to ASAHEC, personal hygiene, non-communicable diseases, preventing teen pregnancy and STDs, and an identification of students interested in health careers. For the next sessions at Faleasao Elementary, Ms. Samoa utilized a more “hands on” format of activities to appeal to the 61 younger students. She showed students how to find their pulse, and to use a stethoscope to listen to their heart. Good hand washing was emphasized, as protection from illnesses such as Rheumatic Heart Disease caused by Streptococcus B. Students jumped rope in order to experience the effect of increased activity on their heart, an exercise given extra emphasis for the older boys and girls, who were asked to run two laps outside their classroom. Miss Bailey and Miss Taotofi joined Ms. Samoa for her third day in Manu’a, with a visit to Matasaua Elementary School’s 41 students on the agenda. The presentation format mostly remained the same presentation as with Faleasao, only with Miss Bailey and Miss Taotofi sharing their experiences with HOSA and with volunteering at LBJTMC. The outreach culminated on the last day with the ASAHEC/HOSA team leading 15 preselected Manu’a High School students on a field trip to the Ta’u Health Center. “Our objectives were to help increase their understanding of healthy lifestyles and health careers,” said Mrs. Samoa. The students got to learn firsthand about healthcare from Medical Doctor Manuel Fernandez, Dentist Dr. Hansel Villarica and Nursing Supervisor Mrs. Puaina Filoialii. 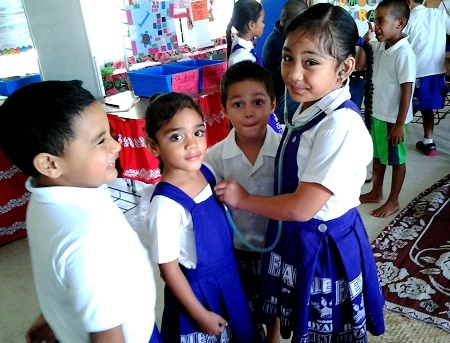 The Ta’u Nursing Staff measured each student’s height, weight and blood pressure. The Medical and Nursing Staff also saw walk-in patients, which gave the students an opportunity to observe and learn after the Staff received the patient’s permission. The field trip ended with each student submitting their information, future career goals and feedback about the event. “This is the second year that ASAHEC has assisted with this event,” said Ms. Samoa. “Although last year’s event was very good, this year was an improvement with the addition of the doctors and the HOSA students. The goal is to see improvement every year to increase student interest in health careers.” HOSA President Miss Bailey echoed the enthusiasm. “Participating in the outreach, I learned a lot that helped me grow as a person and leader,” she reflected. “Talking to the students in Manu'a, and being able to share with them my experiences with HOSA and ASCC allowed me to connect with new people, improve my social and leadership skills, and gave me the chance to learn about the things that affect them.” Miss Bailey also encouraged any students interested in health careers to find out more about HOSA. “It’s an opportunity to set a higher standard for yourself,” she said. ASAHEC is part of a wider network of over 54 Programs and 235 Area Health Education Centers across the United States and the South Pacific. An estimated 120 medical schools and 600 institutes of higher learning which include nursing and allied health studies work collaboratively with these Centers towards the goal of improving health among underserved and under-represented populations. For more information on ASAHEC, call 699-1587.